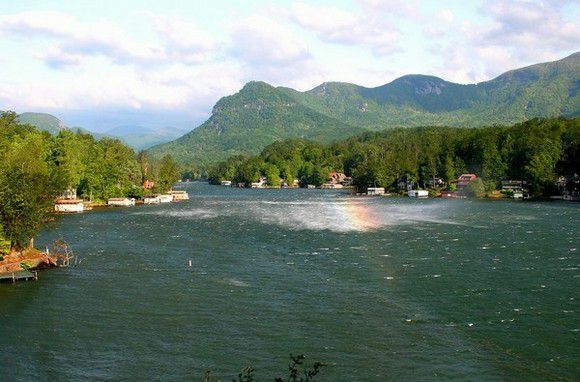 Located about 90 miles west of Charlotte, Lake Lure is a 720 acre large lake situated in a town of the same name. The lake is a popular vacation spot for North Carolina residents and beyond, and boasts plenty of activities. Fishing on Lake Lure is a highlight of a trip for many visitors, and a popular pastime for many locals. So what kind of fish live in the lake? Lots of them. Here's a look at them all. As a note, remember that you will need an annual permit before you put a private boat on the lake. If you don't have a fishing license, you will need to get one before fishing, even if it's just for one day. Here's how to get your North Carolina fishing license. Carp are large fish, and can grow to a length of four feet. You'll find them in slow, standing water and in small schools. This is probably the most common fish in Lake Lure. While very popular in Europe, the carp was often seen in America as a pest. Carp are classified as "rough fish," meaning they are damaging to certain exotic species of fish. That attitude is changing though, and they are becoming known as a highly prized sporting fish - primarily because they're difficult to hook. Bluegill usually grow to about 10 inches, and generally weighs less than a pound. You can easily identify them by a black spot on their ears. These fish like to hide in underwater vegatation and structures, and move between deep or shallow water depending on the season. The most common species of catfish, a channel catfish is easily identified by its forked tail and dark spots along its sides. These fish have a top weight of 45 pounds, but a 10 pound channel cat is considered good for most. These fish usually like clean, warm, quiet waters. They'll be found near rock ledges, weedy areas, log jams, and dams. Crappie are common in Lake Lure. Crappie generally grow to about 9 inches long, and can be found in clear water with cover. They're easier to catch during their feeding times - from midnight until 2 a.m. and 4 to 7 a.m.
Lake Lure has a limit of 20 per day, all must be no less than 8 inches long. Largemouth bass have an olive green color with dark patches that make a horizontal stripe along each side. They grow to about 14 inches, and weigh is 2 or 3 pounds. Largemouth usually put up a good fight when they're being reeled in. You'll catch them around islands, structures like boat docks and rocky areas. They'll also be found feeding under schools of shad. There's a limit of 5 bass combined per day in Lake Lure. That number may include 2 smallmouth under the limit of 12 inches and 2 largemouth under the limit of 14 inches. The perch in Lake Lure grow anywhere from 5 to 9 inches in length, and are considered an easy catch. They live in shallow water, and are often a source of food for larger fish. Anglers will often catch perch and use it as bait for a larger target. Smallmouth bass are usually brown with dark bands and red eyes. Males top out at about two pounds, but females grow to about five or seven pounds. You can catch them in clear, cool waters. There is a limit of 5 bass combined per day in Lake Lure. That number may include 2 smallmouth under the limit of 12 inches and 2 largemouth that are under the limit of 14 inches. Walleye are large fish with an olive color. They can grow up to 30 inches, but most of the time stay around 20 inches. Walleye spawn on rocky bottoms in shallow, clear water, so you can find them in deeper water near those shallow areas. White Bass have a silver color with a white underbelly, and stripes on their side and back. They grow to around 10 to 12 inches long, and usually don't weigh more than 24 ounces. They're schooling fish though, so they tend to gather in high numbers in clear, open water. Where you see one, you'll see more.